'The Place That I Am Not' (2009), Istanbul, 'Children' (2008), London, have created the interest that his latest project 'Baltic Exchange' is already raising. It plans to be a visual essay on the rapidly changing nations that border the Baltic Sea, encapsulating the tradition, culture and altering perspectives of each, together with the common themes that link them. The photographic series is a way of exploring my own state of displacement - self inflicted exile, the experience of being a foreigner and living in a country that is different to the one I grew up in. For the project I would like to do a pilgrimage to the place where I was born and raised - St. Petersburg. 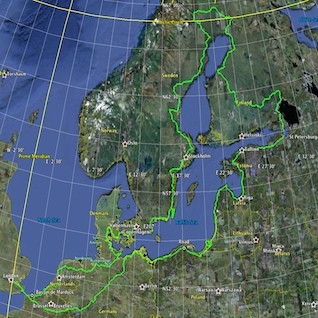 During the project I will do a solo motorbike trip from London to St. Petersburg and back, making a complete circle around Baltic Sea, linking the two places of my existence. The route will go through European and post-Soviet countries - France, Belgium, Netherlands, Germany, Poland, Latvia, Lithuania, Estonia, Russia, Finland, Norway, Sweden, Denmark. The journey is a way of exploring the space and borders between the two places and is an attempt to objectify the distance with memories, photographs, people, objects. It is also a chance to explore my own identity and my relationship to the distance and locations. A journey has always driven its subject towards new identities at whose core the loss of, the tearing away of, the old selves persisting. The loss is both the emptiness of a wound that refuses to heal and at the same time a space of possibility - the openness of an undecided self. One dispersed across space and time, lost and found, unmade and remade in a permanent condition of travelling, realising itself through the indeterminate drift of strangers, objects and occurrences. Elements come together for a split second, stillness, shapes form a unity. The unity is not discovered but created. Things and the photographer move on. Throughout the journey I will be meeting a number of people, hopefully at each stopping place, and ask if each could give me a meaningful object in exchange for one I possess, which, in turn, will be passed onto the next person I meet. Each person will be photographed holding both objects of the exchange. A journal will be kept, describing the progress of the project. The narrative will develop with the change of scenery and objects. As an outcome for the project a book will be produced and two identical exhibitions held simultaneously in St. Petersburg and London. I am back safely. Please visit the blog to see the outcomes of the project. It is constantly developing.